This Face Finding Picture Riddle is dedicated to Harry Potter fans. In this Picture Riddle, there is one image taken from Harry Potter film. In this Image Harry Potter's face is changed by one of the four faces given on the left side of the picture. Can you correctly connect whose face is used in Harry Potter picture out of these four kids? 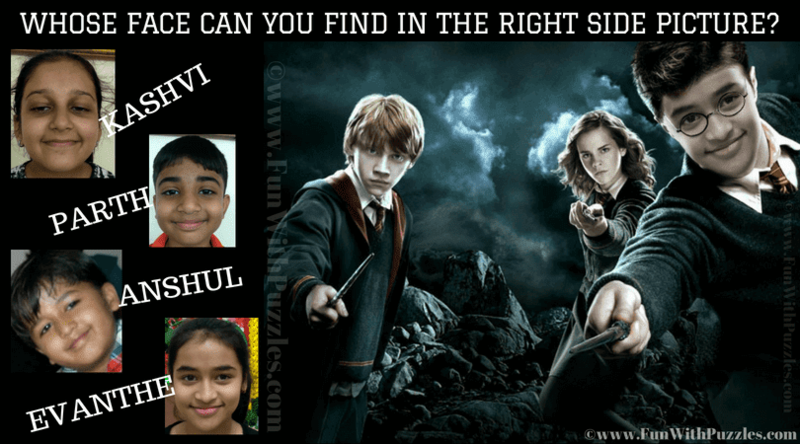 Can you find whose face matches with Harry Potter? Answer of this "Face Finding Picture Riddle", can be viewed by clicking on button. Please do give your best try before looking at the answer.